Tencent team is going to announce PUBG Mobile Prime & Prime Plus subscription plan soon for its PUBG Mobile gamers from around the world. So, once they got PUBG Mobile Prime & Prime Plus membership, it will get easier for them to earn US simply which we will discuss here. As I have a lot of BP on my PUBG Mobile profile, I always wonder to use them to get some PUBG premium items or wish I can convert BP to UC so I can buy the PUBG stuff without paying. And the great news is Tencent team is going to announce PUBG Mobile Prime & Prime Plus subscription plan soon for its PUBG Mobile gamers from around the world. So, once they got PUBG Mobile Prime & Prime Plus membership, it will get easier for them to earn US simply which we will discuss here. The Tencent team has just officially released the PUBG Mobile 0.10.5, and now people are excited about the next PUBG Mobile 0.11.0 update. Well, we have already discussed about next PUBG Mobile version, but today we have come with the great news about the PUBG Mobile Prime and Prime Plus membership plans that is coming soon to PUBG smartphone players. So, what’s PUBG Mobile Prime and PUBG Mobile Prime Plus subscription? How to get PUBG Mobile Prime and Prime Plus membership? How to use PUBG Mobile Prime and Prime Plus membership to buy in-game stuff? When will PUBG Mobile Prime and Prime Plus plan release? How to convert PUBG BP to UC? What is the PUBG Mobile Prime and Prime Plus price? To answer your all questions, here we come to tell you everything about PUBG Mobile Prime and Prime Plus. What are PUBG Mobile Prime and Prime Plus? The new PUBG Mobile Prime and Prime Plus system will let players to earn Unknown Cash (UC) and convert the Battle Points (BP) to Unknown Cash (UC) in PUBG Mobile alongside some other benefits. It will help PUBG gamers to convert 5000 BP for 50 UC which player can use to buy in-game items in PUBG Mobile. 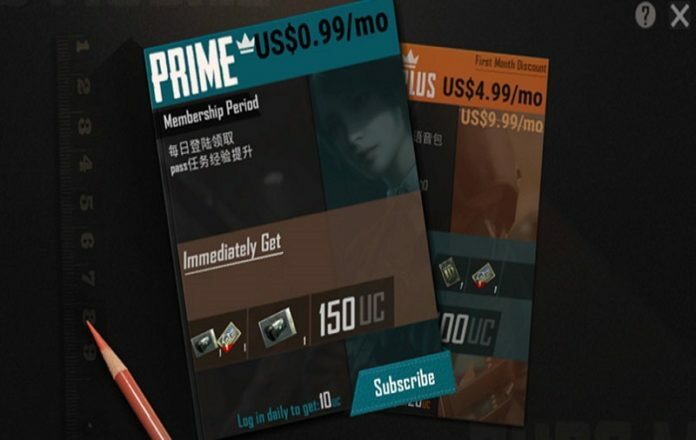 Talking about the price of PUBG Mobile Prime and Prime Plus membership, the Prime membership is supposed to cost $0.99 (Rs 71) and the Prime Plus players will have to pay $9.99 (Rs 710). The validity of the PUBG Mobile Prime and Prime Plus plan expected to be a month. The PUBG Mobile Prime subscription will allow users to right to use to a small amount of UC, maybe 150UC, daily rewards like IDs, UC for logging into the game, and also convert BP to a limited amount of BP. As we said that PUBG Mobile Prime Plus price would be $9.99 per month, but we haven’t told you that you can also get a special introductory price of $4.99 along with that. 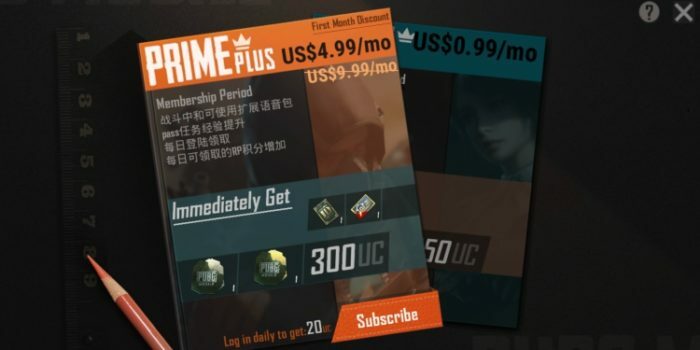 And also Prime Plus players would be receiving around 900UC during the first month of the subscription. What more? This was all about PUBG Mobile Prime and Prime Plus subscription plan that is expected to release on with Amazon from next month. Meanwhile, you can participate in PUBG Mobile India Series 2019 to win up to Rs. 30, 00,000 and dozens of rewards. While the PUBG Mobile Zombie Mode is around the corner.